2017 Schools To Be Announced! 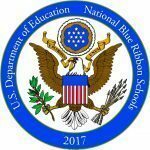 U.S. Secretary of Education Betsy DeVos will announce the 2017 cohort of National Blue Ribbon Schools on Thursday, September 28 at 1:00 pm Eastern Time. The announcement details will be on our home page. Please stay tuned to the NBRS website, our Facebook page and @NatlBlueRibbon on Twitter for more information.